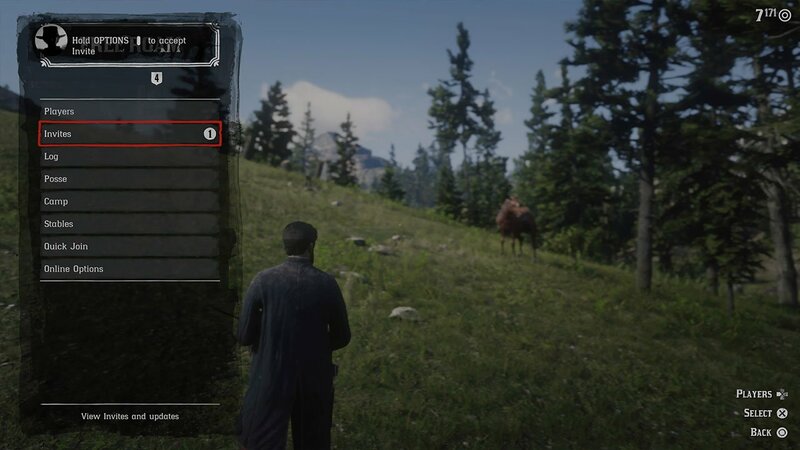 When you get an invite in Red Dead Redemption 2 Online to either a session or posse, you’ll need to accept it through the in-game menu. The only issue is that the menu is quite hard to find. If you know how, you can choose to instead join your friends session or posse through the ‘Players’ menu in the online settings. Which we’ve covered in one of the guides on our site. Below, we’re going to show you where you can find, see and accept invites in Red Dead Redemption 2 Online. Whilst we’ve covered some more guides for the game here. There is a quick way of accepting invites when you receive them. You can do that by holding down the Start/Options button on your controller. Otherwise, open up the player menu by pressing the Left D-Pad button on your controller. Choose the second option down, that says ‘Invites’. In here, you can see any pending invites you have and choose to accept or delete them. Otherwise, you can choose the ‘Players’ option, navigate to friends using L1/R1 (LB/RB). Choose your friend, and then choose the Join Session or Join Posse option.